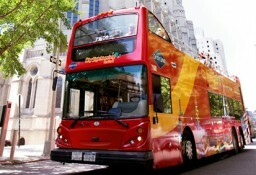 1-day bus pass with access to 2 double-decker bus loops through Uptown and Downtown Manhattan. Features unlimited hop-on hop-off access. Manhattan is brimming with world-class attractions and iconic landmarks. With this convenient pass, you can see it all in just one day! Don’t worry about missing out on anything – from Battery Park at the southernmost tip of the island to Harlem in the north, you’ll see it all! A friendly and professional tour guide will lead you through the city, while offering entertaining narration and pointing out landmarks like Times Square, the Empire State Building, the Brooklyn Bridge, Rockefeller Center, and many more iconic sights. You’ll be able to easily transfer from one tour to the other in Midtown for a seamless excursion through the Big Apple. Unlimited hop-on, hop-off access on two tour loops means the city is yours to explore as you please! Hop off at any of the conveniently located tour stops to discover neighborhoods and attractions up close, at your own pace. When you’re ready to continue the tour, just hop back on the next bus! Buses run every 20-30 minutes, so you’ll never wait long! *Please note: You can use your pass for ONE day within hours of operation. Times vary by tour loop. Please refer to each tour description under “ticket includes” for specific times. Buses run continuously every 20-30 minutes. Fully-narrated double-decker bus tour of Uptown Manhattan. Unlimited hop-on, hop-off access with 20+ convenient hop-off locations! 24-Hour Pass – Your pass spans a 24-hour period for convenient sightseeing! Single Day Pass – Enjoy even more savings by seeing it all in 1 calendar day (pass expires at midnight). 24-Hour Uptown Tour + 1 Attraction - Your pass spans a 24-hour period for convenient sightseeing PLUS admission to one top New York City attraction of your choice! Grab your front row seat to one of NYC’s most dazzling neighborhoods, Uptown Manhattan! Uptown is known for the stunning architecture of the grand mansions and beautiful brownstones that surround one of the city’s most iconic destinations, Central Park. From the many performance halls to the famous Museum Mile, explore the neighborhood where art, history, music, and more come together! 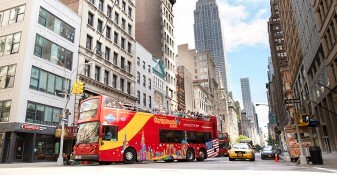 Double decker buses are the best way to see the beautiful homes and famous attractions that Uptown Manhattan is famous for. You’ll have unbeatable, unobstructed views without the hassle of crowds, and a knowledgeable tour guide to provide all of the important details and history along the way! Your tour begins just south of Central Park and will travel along the west side of Manhattan. Sights you’ll see along the way include Lincoln Center, the ornate Cathedral of St. John, Grant’s Tomb, and Columbia University. As your tour proceeds towards the Harlem neighborhood keep an eye out for the famous Apollo Theater, which to this day serves as a performance venue for many musical talents! The tour continues back down the east side of Manhattan, and here you’ll find the incredible stretch of 5th Avenue known as Museum Mile. Hop off to explore The Metropolitan Museum of Art, the Guggenheim, the Museum of the City of New York, or any of the other famous museums and fine art institutions along the way. Our buses run every 25-30 minutes, so you can take your time visiting the museums, admiring the beautiful mansions, or exploring Central Park. However you decide to spend your day in Uptown Manhattan, you’re sure to have the experience of a lifetime. Experience New York’s hub of art, culture, and music, book your Uptown Tour today! 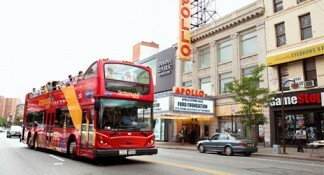 • Double-decker views of: Central Park, Columbus Circle, Lincoln Center, Grant’s Tomb, Apollo Theater and more. How to make the most of your Uptown Tour? Check out our Uptown Guide! Fully-narrated double-decker bus tour of Downtown Manhattan. Unlimited hop-on, hop-off access with 21 convenient hop-off locations! Downtown Manhattan is the heart and soul of the “City that Never Sleeps,” which makes it the perfect place to experience New York City’s iconic sights! On our double-decker Downtown Tour, you’ll begin in world-famous Times Square, where bright lights and billboards set the scene for your one-of-a-kind adventure. Let our professional, well-versed tour guides take you on a journey through other well-known Manhattan neighborhoods, like Greenwich Village, SoHo, the Financial District, Chinatown and the Lower East Side. Sit back and relax as you enjoy double-decker views of famous sights like the Empire State Building, the Flatiron Building, Rockefeller Center, Madison Square Garden, the Statue of Liberty and many more! Make sure to have your camera ready because photo ops are plentiful! What makes this tour truly unique is that you can hop-off at any of our 21 optimally-located stops to explore iconic attractions up close. So enjoy the prime people-watching in Washington Square Park, step inside the lives of early 20th century immigrants at the Tenement Museum on the Lower East Side, or spend lunchtime in Chinatown for the best dumplings and bubble tea you’ve ever had! • Double-decker views of the Empire State Building, Times Square, One World Trade Center, Rockefeller Center, Madison Square Garden and more! • Unlimited hop-on, hop-off access lets you explore sights at your leisure! • Iconic views of the Statue of Liberty from hop-off point in Battery Park! 10. City Hall/World Trade Center/Brooklyn Bridge/911 Tribute Center - Broadway btw. Pine St. & Rector St.
26. Quality Inn/ Hotel Newton - Central Park W btw. 92nd & 93rd St.
29. Apollo Theater - 125th St. btw Frederick Douglas & Adam Clayton Powell Jr. Blvd. How long do I have to use my ticket? This is a one-day ticket so we suggest getting an early start! Once your ticket is scanned to board the bus, you will have the remainder of that calendar day to enjoy both tours. No. When you start your order, you will have to choose the day you believe you are going to use the voucher. However, we do understand that plans change so you have one year from the date of purchase to begin using your pass. After one year, it will expire. Can I use my ticket to board the bus? Both the Uptown Tour and the Downtown Tour of Manhattan features a live guide providing commentary in English. Recorded commentary is also available in: English, Spanish, French, German, Italian, Hebrew, Portuguese, Mandarin Chinese, Korean and Russian. The Downtown Tour runs from 8:00 am - 6:00 pm, daily. The Uptown Tour runs from 9:00 am - 4:00 pm, daily. 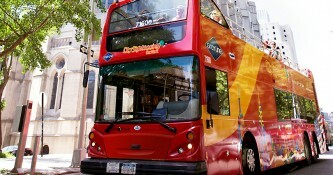 The Downtown Tour takes approximately 2.5 hours, not including optional time spent off the tour bus at hop-off locations.